Qlik won’t be holding a user conference in 2015. Why not spend your training time with us at the Masters Summit for QlikView in New York or Copenhagen this fall? In three days of intense hands on training you’ll take your skills to the next level and come home with the knowledge and tools to advance your company’s QlikView program and resolve those knotty problems. In addition to advanced training from QV experts on scripting, set analysis & aggregation, data modeling, visualization and performance, we are pleased to announce some excellent guest presentations. Christof Schwarz, Senior Solution Architect at Qlik Austria, will join us in Copenhagen with his bag of tricks for both QlikView and Qlik Sense. Christof’s presentation at the 2014 Amsterdam Summit impressed everyone with his elegant solutions to difficult visualization challenges. Shima Auzins, former head of the Visualizations and Demo team at Qlik, now with Infozone, will share her rich knowledge in New York City by presenting some Dashboard Visualization and Design tips that promise to be enlightening. I hope you can join us at one of the Summits. We get incredibly positive feedback from attendees and continue to collaborate afterwards in a private LinkedIn group. Register by July 30 to receive a $300 discount! We’re pleased to announce that new sessions on Qlik Sense and NPrinting have been added to Day 3 of the May 4-6 Masters Summit for QlikView in San Francisco. Vizubi, the creators of NPrinting, have been enthusiastic sponsors of past Masters Summits. In February 2015 Qlik acquired the NPrinting product. On day 3 of the SF Summit, Andrew Porsley of Qlik will provide a technical overview of NPrinting. Leveraging existing QlikView assets in Sense. TLDR: Shameless self promotion and extensive use of links. The Qlik Luminary Program “brings together the best and brightest customers, partners and enthusiasts in the Qlik ecosystem”. Being selected as a Luminary is an honor that acknowledges a significant contribution to the community of Qlik practitioners and customers. The point of my post today is that all four presenters at the Masters Summit for Qlikview were selected as Qlik Luminaries in 2014. What are the odds of that! I expect that one of my colleagues or a QlikCommunity member will post the applicable probability expression — written in QlikView syntax of course. Followed up by a gentle refinement by Henric Cronström — who was a special guest at our 2013 London Summit. At that very same summit Henric not only took us back in time to a QlikView 0.9 demo but also busted the count distinct myth. Speaking of the London Summit, Steve Dark, another 2014 Luminary, contributed valuable experiences during the general sessions and followed up with detailed posts in his blog on questions raised during the summit. While the 2015 Luminary class has not been officially announced, I expect a least a couple of us will repeat as Luminaries. If we don’t all make it, I’ll chalk that off to a smaller class rather than anyone slacking off. Stephen Redmond has announced that he is a member of the 2015 Luminary class. Stephen certainly deserves the honor, having written several excellent and well regarded books on QilkView. Stephen graced us as the guest speaker in the aforementioned London Summit. Speaking of Summit memories, I have fond recollections of the Barcelona Summit. I forgot to pack my trademark hat. Frank Buender of Lynxx BV bought me a substitute hat during our evening social time. Frank also posited many challenging and provocative questions to the Masters and went on to contribute in the private LinkedIn group for Summit attendees. At each Summit, we have a carefully selected guest speaker. In Amsterdam, Christof Schwarz of Qlik wowed the audience with his innovative tips and solutions. I hope to see you at one of the 2015 Masters Summit for Qlikview. I anticipate we’ll see a number of QlikView Luminaries. I expect we will push the boundaries of QlikView, and of course, now Qlik Sense. The bird is in this photo is not a seagull. She’s an earlybird, headed to masterssummit.com to take advantage of the earlybird registration discount available until February 27. At the Summit, birds of the Qlikview Developer variety will be immersed in three days of hands-on advanced and intermediate QlikView Developer training. We’ll be covering topics such as advanced scripting, advanced expressions & aggregation, visualization, data modeling, performance, server administration and Qlik Sense for QlikView customers. Training will be led by four popular instructors, all well known as Consultants, Bloggers, Qlik Luminaries and longtime QlikCommunity contributors. Oleg Troyansky: Author of the upcoming “QlikView Your Business” , QlikView veteran and one of the all time top contributors to QlikCommunity. In addition to the class material, we’ll have an evening panel discussion, guest speakers and plenty of opportunities to network with peers. Read more about the Masters Summit for Qlikview and Register here. See you in San Francisco! I had a great time participating in the Hackathon at the recent Qlik World Conference in Orlando. The Hackathon challenge was to create a visualization solution to a United Nations challenge using the Qik Sense Mashup APIs. It was a stimulating exercise for a number of reasons — the subject matter, the company of talented practitioners, and the Sense API ease of use and powerful functionality. Through my experience with using the APIs and talking with a number of customers at the conference, I see a clear opportunity for existing QlikView customers to leverage Sense as an Extranet or Mashup solution. The existing QlikView data model can be reused by Sense with a simple Binary Load. No need to write additional script and you maintain a single-version-of-truth for both internal and external users. The sense charts and visualizations are much more “webby” in appearance and behavior, meeting the modern expectations of web users and web developers alike. The APIs are powerful, clearly designed and will be easily understood by web developers tasked with integrating Qlik content and data into portals or other interface. Better APIs to get data from the Qlik engine. For example, there are methods to create and return “hypercubes” of data. Pass in Dimensions and Expressions and calculated data is returned — without the need to create a chart. The returned data can be visualized or used to drive another process. The new Session Authentication API can delegate user authentication to an existing portal session, eliminating the need for a piggybacking WebTicketing exchange. This satisfies the common customer requirement that “when the portal session ends, the Qlik session should end”. 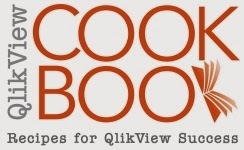 My QlikviewNotes blog has relocated here to the Qlikview Cookbook site. All links from the old qlikviewnotes.blogger.com site have been automatically redirected to this site. If you subscribe to the blog via email on the blogger site, you will need to resubmit your subscription request on the this site. I couldn’t transfer over the existing subscriptions. After successful events in Las Vegas, London and Barcelona, and the upcoming event in Chicago next April 1 – 3, I am pleased to announce that the next European edition of the Masters Summit for QlikView will be held in Amsterdam, The Netherlands on October 1 – 3, 2014. If you are a QlikView developer then the practical skills, ready-to-use resources and excellent peer networking offered at this event will make for 3 days that you do not want to miss! More information about the event can be found on the Masters Summit for QlikView website. Information about the venue will be added soon. If you are based in North America or can’t wait until October, there are still seats available at the Chicago summit April 1-3. Registration is available on the website. The next Masters Summit for Qlikview is approaching. Dates are April 1-3 and the location this year is Chicago. I’ll be joining some of the leading QlikCommunity contributors and authors live for 3 days to discuss advanced techniques in building complex solutions with QlikView. Sessions are targeted at intermediate to advanced Qlikview developers and will cover advanced tools and techniques across a wide spectrum of Qlikview development skills — Scripting, Modeling, Visualization, Expressions, Server, Performance. See the list of sessions here. 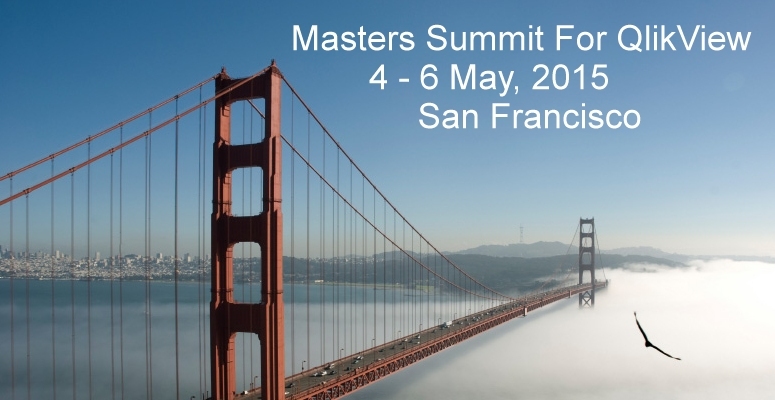 In 2013 Masters Summits were held in Las Vegas, London and Barcelona. Response from the attendees was overwhelmingly positive. Read their comments here. For complete program details and registration information, see the Summit Website. I hope to see you there!